but can lead to permanent residency. to fill a need when American labor is unavailable. to enter the country under an H-4 visa but are not allowed to work. K-1: For the fiancé[e] of a U.S. citizen where the marriage will occur within 90 days. K-3: For the spouse of a U.S. citizen while the application for a green card is pending. may transfer a foreign employee to a local office with one of these visas. The L-1A is for executives, and the L-1B is for individuals with specialized knowledge. Spouse and children of employee may enter the U.S. on an L-2 but may not work. or athletics, with a record of great achievement and indisputably at the top of their field. O-2: Assistants to O-1 visa holders in artistic or athletic events. O-3: For the spouses and children of an O-1 or O-2 visa holder. R-2: For spouses and children of those entering the country with an R-1 visa. individuals must apply for TD visas to enter the country. A-1/2/3: For diplomats, government officials, their families and attendants. B-1: For individuals entering the United States who are briefly visiting for business purposes. B-2: For individuals briefly visiting the United States for pleasure -- also called tourist visas. C: For travelers passing through the United States who don’t intend to enter the United States. children of F-1 visa recipients must apply for F-2 visas to enter the country. 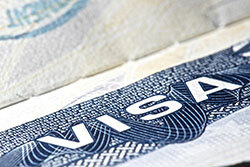 recipients must apply for J-2 visas to enter the country. Q-1: Participants in international cultural exchange programs apply for this visa. in the investigation and prosecution of human trafficking is eligible for this visa.